"I want to know why the Secret Service did not whisk [Bush] away. I want to know why he is the commander-in-chief of the United States of America, our country was clearly under attack, it was after the second building was hit. I want to know why he sat there for 25 minutes [reading to schoolchildren] . . . And I think that I have a lot of problems with the Pentagon. I don't understand how a plane could hit our Defense Department, which is the Pentagon, an hour after the first plane hit the first tower. I don't understand how that is possible. I'm a reasonable person. But when you look at the fact that we spend a half trillion dollars on national defense and you're telling me that a plane is able to hit our Pentagon, our Defense Department, an hour after the first tower is hit? There are procedures and protocols in place in this nation that are to be followed when transponders are disconnected, and they were not followed on September 11th . . . There are 3,000 lives lost and three million questions remaining." With regard to the 9/11 attacks, it has been said that the intelligence agencies have to be right 100% of the time and the terrorists only have to get lucky once. This explanation for the devastating attacks of September 11th, simple on its face, is wrong in its value. Because the 9/11 terrorists were not just lucky once: they were lucky over and over again. Allow me to illustrate. The terrorist's lucky streak began the week before September 11th with the Securities and Exchange Commission, or SEC. The SEC, in concert with the United States intelligence agencies, has sophisticated software programs that are used in "real-time" to watch both domestic and overseas markets to seek out trends that may indicate a present or future crime. In the week prior to September 11th both the SEC and U.S. intelligence agencies ignored one major stock market indicator, one that could have yielded valuable information with regard to the September 11th attacks. On the Chicago Board Options Exchange during the week before September 11th, put options were purchased on American and United Airlines, the two airlines involved in the attacks. The investors who placed these orders were gambling that in the short term the stock prices of both Airlines would plummet. Never before on the Chicago Exchange were such large amounts of United and American Airlines options traded. These investors netted a profit of at least $5 million after the September 11th attacks. Interestingly, the names of the investors remain undisclosed and the $5 million remains unclaimed in the Chicago Exchange account. Why these aberrant trades were not discovered prior to 9/11? Who were the individuals who placed these trades? Have they been investigated? Who was responsible for monitoring these activities? Have those individuals been held responsible for their inaction? Prior to 9/11, our US intelligence agencies should have stopped the 19 terrorists from entering this country for intelligence reasons, alone. However, their failure to do so in 19 instances does not negate the luck involved for the terrorists when it comes to their visa applications and our Immigration and Naturalization Service, or INS. With regard to the INS, the terrorists got lucky 15 individual times, because 15 of the 19 hijackers' visas should have been unquestionably denied. Most of the 19 hijackers were young, unmarried, and un-employed males. They were, in short, the "classic over-stay candidates". A seasoned former Consular officer stated in National Review magazine, "Single, idle young adults with no specific destination in the United States rarely get visas absent compelling circumstances." Yet these 19 young single, unemployed, "classic overstay candidates still received their visas." I am holding in my hand the applications of the terrorists who killed my husband. All of these forms are incomplete and incorrect. Some of the terrorists listed their means of support as simply "student" failing to then list the name and address of any school or institution. Others, when asked about their means of support for their stay in the US wrote "myself" and provided no further documentation. Some of the terrorists listed their destination in the US as simply "hotel" or "California" or "New York". One even listed his destination as "no". Had the INS or State Department followed the law, at least 15 of the hijackers would have been denied visas and would not have been in the United States on September 11th, 2001. Help us to understand how something as simple as reviewing forms for completeness could have been missed at least 15 times. How many more lucky terrorists gained unfettered access into this country? With no one being held accountable, how do know this still isn't happening? On the morning of September 11th, the terrorists' luck commenced with airline and airport security. When the 19 hijackers went to purchase their tickets (with cash and/or credit cards) and to receive their boarding passes, nine were singled out and questioned through a screening process. Luckily for those nine terrorists, they passed the screening process and were allowed to continue on with their mission. But, the terrorist's luck didn't end at the ticket counter; it also accompanied them through airport security, as well. Because how else would the hijackers get specifically contraband items such as box-cutters, pepper spray or, according to one FAA executive summary, a gun on those planes? Finally, sadly for us, years of GAO recommendations to secure cockpit doors were ignored making it all too easy for the hijackers to gain access to the flight controls and carryout their suicide mission. Prior to 9/11, FAA and Department of Defense Manuals gave clear, comprehensive instructions on how to handle everything from minor emergencies to full blown hijackings. These "protocols" were in place and were practiced regularly for a good reason--with heavily trafficked air space; airliners without radio and transponder contact are collisions and/or calamities waiting to happen. Those protocols dictate that in the event of an emergency, the FAA is to notify NORAD. Once that notification takes place, it is then the responsibility of NORAD to scramble fighter-jets to intercept the errant plane(s). It is a matter of routine procedure for fighter-jets to "intercept" commercial airliners in order to regain contact with the pilot. If that weren't protection enough, on September 11th, NEADS (or the North East Air Defense System dept of NORAD) was several days into a semiannual exercise known as "Vigilant Guardian". This meant that our North East Air Defense system was fully staffed. In short, key officers were manning the operation battle center, "fighter jets were cocked, loaded, and carrying extra gas on board." Lucky for the terrorists none of this mattered on the morning of September 11th. Let me illustrate using just flight 11 as an example. American Airline Flight 11 departed from Boston Logan Airport at 7:45 a.m. The last routine communication between ground control and the plane occurred at 8:13 a.m. Between 8:13 and 8:20 a.m. Flight 11 became unresponsive to ground control. Additionally, radar indicated that the plane had deviated from its assigned path of flight. Soon thereafter, transponder contact was lost - (although planes can still be seen on radar - even without their transponders). Even more baffling for us is the fact that the fighter jets were not scrambled from the closest air force bases. For example, for the flight that hit the Pentagon, the jets were scrambled from Langley Air Force in Hampton, Virginia rather than Andrews Air Force Base right outside D.C. As a result, Washington skies remained wholly unprotected on the morning of September 11th. At 9:41 a.m. one hour and 11 minutes after the first plane was hijack confirmed by NORAD, Flight 77 crashed into the Pentagon. The fighter jets were still miles away. Why? So the hijackers luck had continued. On September 11th both the FAA and NORAD deviated from standard emergency operating procedures .Who were the people that delayed the notification? Have they been questioned? In addition, the interceptor planes or fighter jets did not fly at their maximum speed. Had the belatedly scrambled fighter jets flown at their maximum speed of engagement, MACH-12, they would have reached NYC and the Pentagon within moments of their deployment, intercepted the hijacked airliners before they could have hit their targets, and undoubtedly saved lives. The acting Joint Chief of staff on Sept 11th was on the morning of September 11th, he was having a routine meeting . Acting Joint Chief of staff Myers stated that he saw a TV. report about a plane hitting the WTC but thought it was a small plane or something like that. So, he went ahead with his meeting. "Meanwhile the second World Trade Center was hit by another jet. Nobody informed us of that," Myers said. By the time he came out of the meeting the Pentagon had been hit. Whose responsibility was it to relay this emergency to the Joint Chief of Staff? Have they been held accountable for their error? Surely this represents a breakdown of protocol. The Secretary of Defense, was at his desk doing paperwork when AA77 crashed into the Pentagon. As reported, Secretary Rumsfeld felt the building shake, went outside, saw the damage and started helping the injured onto stretchers. After aiding the victims, the Secretary then went into the 'War Room'. How is it possible that the National Military Command Center, located in the Pentagon and in contact with law enforcement and air traffic controllers from 8:46 a.m. did not communicate to the Secretary of Defense also at the Pentagon about the other hijacked planes especially the one headed to Washington? How is that Secretary of Defense could have remained at this desk until the crash? Whose responsibility is it to relay emergency situations to him? Is he then supposed to go to the war room? At 6:15 a.m. on the morning of 9/11, my husband Alan left for work; he drove into New York City, and was at his desk and working at his NASDAQ Security Trading position with Cantor Fitzgerald, in Tower One of the WTC by 7:30 a.m. In contrast, on the morning of September 11, President Bush was scheduled to listen to elementary school children read. Before the President walked into the classroom NORAD had sufficient information that the plane that hit the WTC was hijacked. At that time, they also had knowledge that two other commercial airliners, in the air, were also hijacked. It would seem that a national emergency was in progress. Yet President Bush was allowed to enter a classroom full of young children and listen to the students read. Why didn't the Secret Service inform him of this national emergency? When is a President supposed to be notified of everything the agencies know? Why was the President permitted by the Secret Service to remain in the Sarasota elementary school? Was this Secret Service protocol? In the case of a national emergency, seconds of indecision could cost thousands of lives; and it's precisely for this reason that our government has a whole network of adjuncts and advisors to insure that these top officials are among the first to be informed--not the last. Where were these individuals who did not properly inform these top officials? Where was the breakdown in communication? Is it luck that aberrant stock trades were not monitored? Is it luck when 15 visas are awarded based on incomplete forms? Is it luck when Airline Security screenings allow hijackers to board planes with box cutters and pepper spray? Is it luck when Emergency FAA and NORAD protocols are not followed? Is it luck when a national emergency is not reported to top government officials on a timely basis? In the months leading up to the attacks you were repeatedly advised of a possible attack on American soil. During your daily intelligence briefings you were given information that had been uncovered that the very real possibility existed that certain undesirable elements would use commercial aircraft to destroy certain "target" buildings. You never warned the American people of this possible threat. Who were you protecting? When you took no responsibility towards protecting the general public from the possibility of attack, you were certainly not upholding the oath you spoke when you took office. In that oath you pledged to uphold the Constitution of the United States of America. It is my belief that you intentionally allowed 9/11 to happen to gather public support for a "war on terrorism". These wars, in Afghanistan and Iraq, have not accomplished what you stated were your goals. Why have you not captured Osama Bin Laden? Where are Saddam's weapons of mass destruction? All that has happened is a bill that is passed before Congress for 87 billion dollars to rebuild what you ordered blown to bits. As an American who lost a loved one in the "war on terror" I do pray and support our troops who were sent to Afghanistan and Iraq by you. These troops have and will continue to die for your lies. As an American I can make this statement as it appears that associates of your family may stand to prosper from the rebuilding of Afghanistan and Iraq. Mr. Bush the time has come for you to stop your control over us. Stop blocking the release of certain evidence and documents that were discovered by the 9/11 Investigation Commission if you have nothing to hide proving you did not fail to act and prevent the attacks of 9/11. Your reason for not releasing this material is that it is a matter of "national security". When in fact I believe that it is your personal credibility/security that you are concerned with. You do not want the public to know the full extent of your responsibility and involvement. 1. Why were 29 pages of the 9/11 committee report personally censored at your request? After Ellen Mariani withdrew her lawsuit in 2004, her attorney, Phil Berg, filed a new RICO lawsuit against the Bush administration that contained several blatant erroneous statements that could be used as excuses to dismiss the suit. Perhaps Ellen Mariani should have taken the money and used it to help publicize the best information about 9/11 complicity. Berg filed Rodriguez v. Bush, et al., Civil Action No. 04 cv 4952, in the U.S. District Court in Philadelphia, on October 22, 2004. This lawsuit is much longer and goes much further than the lawsuit on behalf of Miriani, in alleging that officials "were complicit in the 9-11 attacks, and either planned the attacks, or had foreknowledge of the attacks and permitted them to succeed, in order to exploit a 'New Pearl Harbor' to launch wars against Afghanistan and Iraq." The complaint goes even further than Stanley Hilton's in its kitchen-sink approach of naming numerous defendants and numerous and wide-ranging allegations of criminality. This approach is diametrically opposed to the one that would appear to have the best chances of success: a narrow focus on the most provable charges against a few individuals. The complaint fails to apply the smell test to the allegations it lists, and includes thoroughly debunked and patently nonsensical claims among the valid ones. Interestingly, while it fails to cite any 9/11 skeptics' websites or books that provide substantial evidence of insider inolvement, it trumpets the hoax-promoting site LetsRoll911.org. Evidence wholly independent of video images purporting to show missiles being fired into the WTC towers amply shows (1) that the planes’ impact and jet fuel fires do not sufficiently explain the collapse of the towers; and (2) there is abundant evidence of high explosives at the foundations and controlled demolitions. Even more shocking than the consumer-quality videotape of the Naudet Brothers are the images that can be seen on HYPERLINK "http://www.letsroll911.org" www.letsroll911.org. These images from major news sources show “Flight 175” as it strikes the South Tower on 9-11. When slowed down, the images appear to show (albeit not very distinctly) (a) an apparatus on the underside of “Flight 175,” believed to be a missile pod, not normally found on the Boeing 757; and (b) a bright object projected from the location of the pod preceding (by perhaps 1/3 second) the plane into the South Tower. No major media outlet has reported on these images, as the same are presented on the HYPERLINK "http://www.letsroll.911.org" www.letsroll.911.org website. 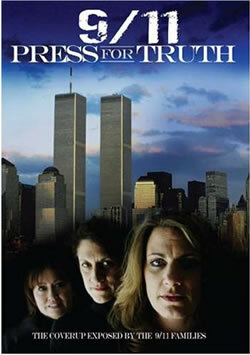 As the website owner himself admits, many thousands of copies of the “Flight 175” images from CNN and other major media outlets must exist on Americans’ shelves, as the second strike occurred when millions had their TV sets on and, no doubt, many people taped the terrible events as they occurred. Thus, as the HYPERLINK "http://www.letsroll911.org" www.letsroll911.org webmaster, Phil Jayhan, states by way of a challenge, if the images presented on that website are not genuine, refuting them ought to be an easy task. 112. The “letsroll911” video images remain controversial even within the growing community of 9-11 skeptics, and perhaps they are insufficiently clear to establish the “missile and pod” theory beyond a reasonable doubt. Nevertheless, the number of “hits” on the website and other evidence suggests that many agencies of the U.S. government and the media claiming to have produced the images have repeatedly visited the HYPERLINK "http://www.letsroll911.org" www.letsroll911.org website, and certainly the images are convincing enough at least to demand careful examination. One would think, certainly, that if some activist were attracting huge attention (if only on the internet) by publicizing major media images from 9-11 that had been doctored to add a missile being fired from “Flight 175,” the media would have reacted publicly, or sought a court injunction to disavow and discredit the doctored images. Upon information and belief, none of the media have claimed the images appearing on the website to be anything but genuine. If they do show the firing of a missile, and they are genuine, then clearly the Official Story— although “alive and well” as Enterprise, CNN, Fox News and other captive media propaganda sources — is, in objective fact, a dead letter. One Sept. 11 widow, Ellen Mariani of New Hampshire, has even filed a federal lawsuit in Philadelphia accusing the president of letting the attacks happen to justify the wars in Afghanistan and Iraq. Families sue U.S., reject 9/11 `bribe', ignore deadline for compensation. Payouts average $1.8 million. WASHINGTON—For some, it's blood money, a repugnant payoff they feel they have no choice but to accept. For a handful of others, the process of claiming compensation is too painful: they find themselves paralyzed by grief and unable to reopen emotional wounds barely healed from the deaths of their loved ones in the Sept. 11, 2001, terrorist attacks. But as many as 73 families see the process of U.S. government compensation as an attempt to protect those who should be held accountable for what they believe was mass murder. They ignored a midnight deadline last night, their last chance to apply for government cash. And today, they begin a new stage in an arduous odyssey and will sue their government, airlines and state and local authorities. "This may be uncharted waters, but I was thrown in a pool on Sept. 11, 2001 and had to learn to swim," said Monica Gabrielle, who lost her husband Richard in the World Trade Center attack. "I am doing this for my husband. He was a gentle man, and he was alive, trying to get out of that building that day. The dead. The dying. The smoke. The terror. No one should have suffered like that. I want accountability. I need answers." The compensation fund has been controversial since President George W. Bush signed it into law 13 days after the attacks. For those who lost family members, it was always about protecting airlines, federal, state and local authorities from billions of dollars of lawsuits. To receive the federal money, recipients must sign a waiver giving up their right to sue anyone involved in the worst terrorist attacks in U.S. history. A late surge of claims on deadline yesterday meant close to 95 per cent of the 2,976 families who lost loved ones in New York, Washington and Pennsylvania were expected to finally take the money. To get there, they had to accept a monetary value on the lives of those closest to them, after making a case based on birth and marriage licences, diplomas and degrees, even videos. They will, on average, receive $1.8 million (all figures U.S.) each. Families of 24 Canadian victims are eligible for compensation and most have applied. Brian Alexander, a New York lawyer representing a portion of the victims who have launched the lawsuit, said he knew of no Canadians involved. He said those who have chosen to sue have put no dollar figure on awards and each claim will be individually tailored. "A widow who is 80 years old is not in the same category as a widow who lost her husband at age 30 and has four kids at home," he said. Some $1.5 billion had been paid from the government fund by the weekend. Compensation for individual deaths has ranged from $250,000 to $6.9 million. Those physically injured as a result of the attacks have received compensation ranging from $500 to $7.9 million. "Only in America could there be a program like this," fund administrator Kenneth Feinberg told CNN yesterday. "You wouldn't find a program paying an average $1.8 million tax-free to eligible families. This is an unprecedented, unique program and exhibits I think the best in the American people." Yet Gabrielle says it is a bribe by the government so victims can be coerced into washing their hands of the affair. She is also resentful that the government is determining the worth of loved ones. "This is about mass murder," she said. "I want to know who was responsible. "No one has been fired. No one has been demoted. The same people who are guarding us today on an elevated security alert are the same people who were working that day." Gabrielle said she is looking at a special 9/11 commission headed by former New Jersey governor Thomas Kean to answer the question of responsibility. Kean has battled the White House, New York and aviation authorities for access to documents. He has a May deadline. "There are people that, if I was doing the job, would certainly not be in the position they were in at that time because they failed. They simply failed," Kean told CBS last week. He said later he was talking of lower level officials, but Gabrielle and others want to know more about the safety of the buildings and airport security. Even those who have accepted the money see it only as the lesser of two evils. Irene Golinski, 53, whose husband died in the Pentagon attack, was still grappling with the decision to put 9/11 behind her or continue with a lawsuit. "It's almost like it's a payoff to save the airlines and not hold any of those people responsible for what happened," she said. Feinberg's office detailed some awards. The beneficiary of a 36-year-old project manager earning $231,000 and with one dependent was paid $3.48 million, while the beneficiary of a 26-year-old military officer with no dependents and a $44,000 salary got $1.84 million. The U.S. government made two promises to the families of those who died in the Sept. 11, 2001, terror attacks: A special Justice Department fund would compensate their financial losses and official investigations would uncover the security failures that enabled al-Qaeda to kill 3,027 people. The wife of a victim of the Sept. 11 terrorist attacks has filed a lawsuit in federal court alleging President Bush and several other high-ranking administration officials failed to prevent the attacks from occurring and are now obstructing justice. Ellen Mariani filed a lawsuit Nov. 26 under the 1970 Racketeer Influenced and Corrupt Organizations (RICO) Act with the U.S. District Court for the Eastern District of Pennsylvania. The suit alleges that President Bush and other officials knowingly and willfully failed to act to prevent the murder of her husband, Louis Neil Mariani, who was a passenger on United Airlines Flight 175, which crashed into the south tower of the World Trade Center. Mariani's attorney, Philip Berg, said he plans to call former federal employees with firsthand knowledge and expertise of military intelligence to testify in support of the suit. He alleges that the White House, Pentagon, Justice Department, Federal Aviation Administration, CIA and FBI were negligent in preventing the attacks and now are withholding information about the incidents. Berg said he believes the lawsuit is the first Sept. 11 case filed under the RICO Act, which the government enacted to fight organized crime. The lawsuit is an amended version of a lawsuit Mariani previously filed in court. Berg added he hopes other Sept. 11 victims and federal employees will support or join the lawsuit. However, he speculated that government workers are afraid to come forward with information. "The word is out: 'Don't divulge information here,' " he said. "We have many people in the government who are afraid to come forth with information. They're afraid for their jobs." A court hearing is schedule for Jan. 14. Richard Manieri, spokesman for the U.S. attorney's office, declined to comment on the case. "We're reviewing the compliant and considering our options," he said. Mariani vs. Bush, U.S. District Court for the Eastern District of Pennsylvania (03-5273), Nov. 26, 2003.
presented in this case through discovery, subpoena power, and testimony [that] Defendants failed to act and prevent 9/11 knowing the attacks would lead toâ€| an 'International War on Terror' which would benefit Defendants both financially and politically." There is a clear method and message in this obscurantist madness. All this media consolidation and tightening control is strategically aligned with deregulation, privatization, social program-gutting deficits and free trade regimes. They are all convergent tactics to enforce corporations' full spectrum dominance over democratic humankind. If your progressive or conservative instincts bid you to arise against this coup, standing with our 9/11 widow is a good place to start. Her name is Ellen Mariani, her lawyer is Phillip Berg and their complaint is now online at http://www.nancho.net/911/mariani.html &http://www.scoop.co.nz/mason/stories/HL0311/S00224.htm . Read it and weep, wail, or whack out a dozen letters to the editors around your town, but for god's sake make some noise. When 9/11 bombshells fall silent in the corporate media's forest it's up to us to make them resound. February 5, 2004—On September 10, 2001, Ellen Mariani and her husband Louis "spent their last day together as husband and wife on this earth." A range of theories about what happened on 9/11 has emerged. The Bush administration's story is that a guy with a long grizzled beard living in a cave in Afghanistan surprised the $40 billion a year U.S. intelligence community by hijacking domestic airplanes and crashing them into symbols of U.S. economic dominance and war. Independent journalists, researchers, and activists have put forth evidence to support scenarios that Bush knew about 9/11 and let it happen (Mariani's suit) and/or that 9/11 was an inside job—an operation of shadow elements of the U.S. government. Joyce Lynn is a journalist and was a political reporter for eight years in Washington, DC. She is editor of the Political Diary. She can be reached at politicaldiary at hotmail.com.